Lock in a great price for Villa Le Grand Bleu – rated 9.8 by recent guests! Stellio and Aggeliki were some of the most welcoming hosts I have ever had in a hotel. They contact you before you arrive to arrange picking you and your luggage up at the port. The hotel is less than a 5 minute drive from the port, and definitely within walking distance. Once at the hotel, you will be taken away by the beauty of the sunset disappearing into the sea every evening! The rooms are bungalow style, with balconies and windows that allow a refreshing breeze to blow through every night. Most importantly, they were wonderful hosts that made you feel like you were welcome in their home. Everything about this stay was perfect, and I will definitely be returning! Very friendly and helpful staff. Clean and comfortable room. Peaceful and nice location. Definitely recommend! 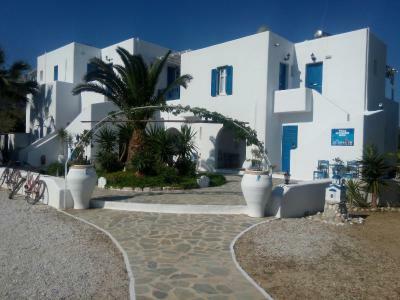 Excellent place to stay in Amorgos, probably the best. Wonderful room: nice, comfortable and with a very nice view; well placed: near to the harbor of Katapola but in a quiet situation, and an incredibly friendly staff who give us all sort of attentions from arrival to last minute of our stay. Thanks to Stergios and Angeliki, that in addition of their hospitality help us to change our plans when our ferry was cancelled by the bad weather. See you soon! Nice location, very friendly & helpful owners, big balconies, always hot water, sufficient internet. We were picked up from the port, a nice unexpected service! The surroundings are quiet, yet it´s only a few steps to the next tavernas & shops. You need to stay at this place if you go to Katapola! The rooms are spacious, the staff is very welcoming and it offers a very nice view! We bought some food at the grocery store and took our breakfast on our balcony. It was perfect! You are walking distance to Katapola. Also, the bus stop is a 5 minutes walk away. Very nice way to visit the island by the way! Stergios and Aggeliki are so warm and welcoming. They came to pick me up from the port when I arrived and gave me lots of useful information about transportation and places to go, as well as some lovely treats. They really made me feel at home. The rooms are very well set up with a place to put everything, even to having a toothbrush holder in the bathroom. The location is quiet, a little removed from the port area, but an easy 10 minute walk away, and there are cafes and restaurants nearby too. I only wish I could have stayed longer. Location, owners, value for money. 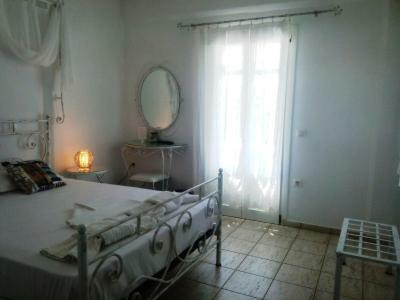 Rural property close to the water and surrounded by animals and vegetable farms. Loved seeing the donkey, horses, sheep etc on my way to the water. The owners were very generous and helpful. We highly recommend this place as a base on Amorgos! Very nicely decorated, with lots of care for details. I loved everything about this accommodation: the garden spaces, with sofas under the shade of olive trees and the little veranda of our studio looking out towards the sea. The hosts are great people, always ready to greet you with a warm smile and willing to help with any requests. The studios are immersed in the greenest spot of Katapola, but still just 100m from the pebble beach, it's truly a lovely location. The couple who owned and ran the hotel were incredibly friendly and helpful. This vacation was very relaxing and nourishing and feel this venue was a big part of the reason. Within 650 feet from the sandy Katapola Beach in Amorgos, Villa Le Grand Blue features air-conditioned accommodations with a sea-view balcony or patio. The Cycladic-style property is set amid a fragrant garden and offers free bicycles and free Wi-Fi in all areas. Traditionally decorated with wrought-iron beds and white-washed walls, the rooms of Grand Blue have a fridge, a safe and a TV with satellite channels. The private bathroom is stocked with slippers, a hairdryer and free toiletries. Guests can prepare their own breakfast or other meal at the common kitchenette in the garden, where BBQ facilities are also featured. Restaurants, bars and shops can be found within a short walk from the property. Villa Le Grand Blue lies within 2,450 feet from Katapola Port and within 12 mi from Aigiali Village and Port. 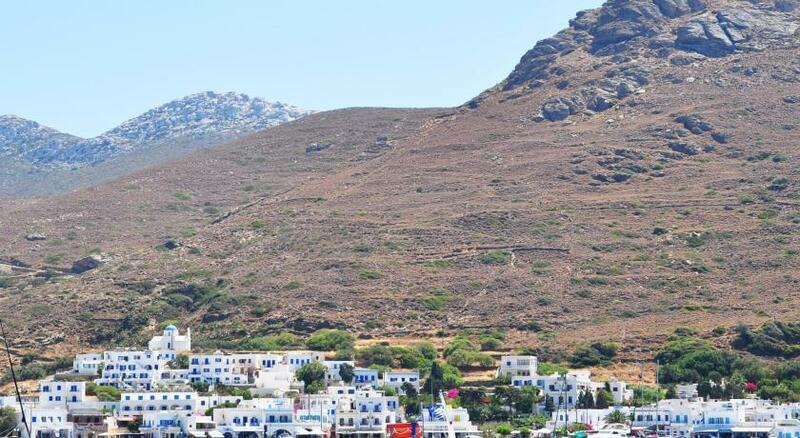 The scenic Amorgos Town is at 3.1 mi, while the famous pebbled beach of Agia Anna is 4.3 mi away. Free transfer from Katapola Port can be arranged and free private parking is possible on site. When would you like to stay at Villa Le Grand Bleu? -iron and ironing facilities upon request. 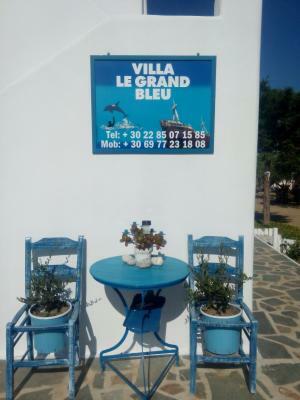 House Rules Villa Le Grand Bleu takes special requests – add in the next step! Villa Le Grand Bleu accepts these cards and reserves the right to temporarily hold an amount prior to arrival. Since there´s no breakfast available, it would have been nice to have a small kitchenette to prepare one´s breakfast in the room - this is the only thing we missed. But we knew this before, description was correct! Nothing, we loved our stay at Villa Le Grand Bleu! Staff very friendly. Good service. 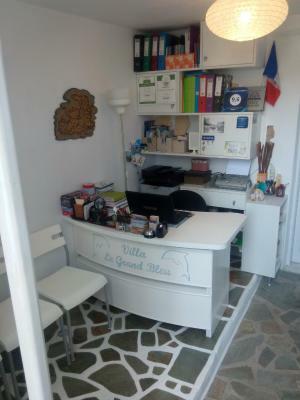 Stergios and Angeliki are very friendly and helpful. 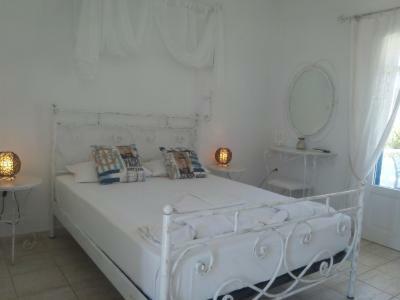 We highly recommend "Le Grand Bleu" Villa in Amorgos just near the pier of Katapola. 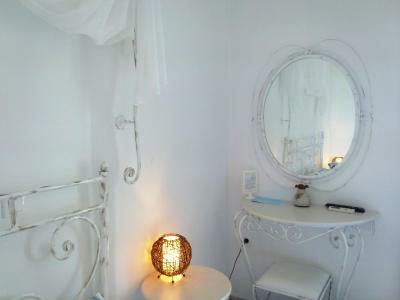 The location is terrific and rooms are clean & bright.